Dan received his Bachelor’s Degree from the University of Southampton Oceanography Centre, studying the clay mineralogy of mud volcanoes and diapirs along the Iberian continental margin using x-ray diffraction techniques. 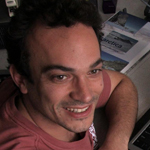 Since then he has worked at the University of Maine Climate Change Institute (CCI) conducting field work drilling ice cores in Antarctica, Southern Patagonia, the New Zealand Southern Alps, and the Central Chilean Andes. As a member of the United States International Trans-Antarctic Scientific Expedition team, Dan has completed five Antarctic field seasons, traversing >10,000 km over the ice sheet. His research is focused on the reconstruction of Antarctic and global paleoclimate over the last ~1000 years using the chemistry contained in snow and ice. Since arriving in Maine, Dan has earned his Master’s Degree in Quaternary and Climate Studies and his PhD in Earth Sciences.